As Canadians begin to learn to live without the penny, I thought that it would be a good time for some penny facts…. The penny was first minted by the Canadian Government in 1858. It Weighed 4.54 grams, and comprised of 95% copper. It had a mintage of approximately 421,000. Rarest Canadian Penny is the 1936 Dot Coin. There are only 3 known specimens. In January 2010 a 1936 coin sold for $400,000 dollars at auction. Queen Victoria (1858-1901), King Edward VII(1902-1910), King George V (1911-1936), King George VI (1937-1952), and Queen Elizabeth II (1953-2012) have all been the face of the penny. 2006 was the highest mintage of the Canadian penny at over 1.2 billion Pennies struck. Last penny was struck on May 4th 2012. It weighed 2.35 grams (almost half the weight of the original penny), and comprised of 94% steel. Only 4.5% was copper plating. It cost approximately 1.6 cents to make the 1 cent coin. What will you do with your pennies…. It is now official, the Canadian government has killed the Penny. 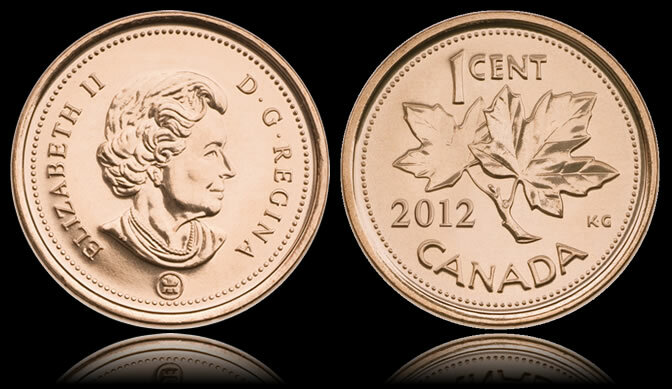 As of February 4th, 2013 the penny will no longer be produced or relevant within the Canadian Economy. Or will it? You cannot argue with the government reasoning to put the penny into retirement, after all it costs almost double the face value of coin, and in the end is expected to save the Canadian Tax payer $11 Million a year. But will the penny ever be irrelevant to the Canadian people. In my opinion No. There are so many pennies out in circulation that no one can even hazard a guess as to how many exist. In 2011 alone the Canadian Mint issued 662,750,000, and over 1.2 Million in just 2006. (well according to the Mintage numbers posted on the mints website). Based on the numbers posted, between 2000 and 2011 the Canadian Mint minted approximately 9,519,572,000 pennies. That’s alot of Pennies. That’s alot of money sitting in piggy banks, purses, jars, or just laying around. Pennies just waiting to become something other then a now obsolete currency coin. What would you do if you found 100 pennies, 1000 pennies, or 10,000 pennies? Would you put them to good use, or continue to forget about them, and leave them laying around? One group of Canadians that are hoping to cash in on the retirement of the Penny is our charities. You see them everywhere right now, penny collection jars. Please do not let this coin go unused, forgotten, or over looked. Use your pennies for things that are needed. They really do start to add up, when they are a collected and used. Just like any journey, adventure or voyage, they all begin with a single step. The idea of understanding money, business and finances all begin with 1 lonely penny.